A wrong-way driver and her two passengers were killed in a head-on collision with a gasoline tanker truck on Interstate 275 just south of Bearss Avenue early Sunday. This is the fourth fatal wrong-way crash on I-275 in Tampa this year that has happened just before sunrise. The Florida Highway Patrol believes a 2013 Honda sedan was traveling south in the inside lane of northbound I-275 when it crashed into a Gemini Motor Transport tanker that was headed north. Both vehicles came to a halt in the northbound lanes. The car’s driver, along with another woman in the front passenger seat and a man sitting in the back, all died at the scene. There is no information regarding when, where or why the women entered the interstate heading in the wrong direction at this time. The driver of the tanker, a 50-year-old Lakeland man, was not injured. No fuel was spilled, however the crash created a lot of debris. This is not the first wrong-way collision on I-275 in Tampa in the last seven months. On Feb. 9, a 28-year-old man driving south in the northbound lanes of I-275 collided near Busch Boulevard with a 2010 Hyundai carrying four University of South Florida fraternity brothers. All five men were killed. Less than two weeks later, a 25-year-old drove a Honda Civic north on the southbound side of I-275 and smashed into a rental truck near Bearss Avenue. The man was killed and the two men in the truck suffered personal injuries. Last month, a 23-year-old man was killed after he crashed into an ambulance after entering I-275 from I-4 going north in the southbound span. According to the FHP, most of these wrong-way accidents involved drivers making U-turns on the highway. Impairment was at least suspected in the previous wrong-way crashes. Troopers said it is too early to tell whether it was a factor in this crash. In an effort to combat this serious problem, officials with the Florida Department of are taking steps to better protect motorists against wrong-way drivers. Message boards warn motorists once a 911 call has been made. The agency is also testing interstate sensors that would automatically notify the FDOT of a wrong-way driver even before that first 911 call. Wrong way collisions are usually very serious due to the fact that two vehicles traveling at moderate to high speeds generally do not have enough time to break or take any other evasive action to avoid a head-on collision. A crash of this magnitude creates significant impact forces into the occupant compartments of both vehicles. Sadly, catastrophic injuries and death are quite often the result of wrong way accidents. One of the most common causes of wrong way collisions is drivers operating their vehicles under the influence of either drugs or alcohol. 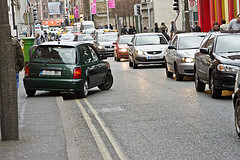 While this is certainly not the only reason these accidents occur, it is usually a factor. If you or someone you love has been injured or killed by a wrong-way driver, a Tampa Bay Injury Lawyer at Whittel & Melton can help you pursue legal action for damages. We handle all wrong way accident cases on a contingency basis which means we don’t get paid unless we are successful in recovering damages on your behalf. To find out more, please call us today at or contact us online.